I've heard the horror stories: you spend hours cleaning your house to impress her and she shows up and checks to see if there are crumbs in your toaster oven. I know about the "Monster-In-Laws". But that is just not what it's like for me. I don't know what it looks like when your mother-in-law visits, but this is what it looks like when mine does. 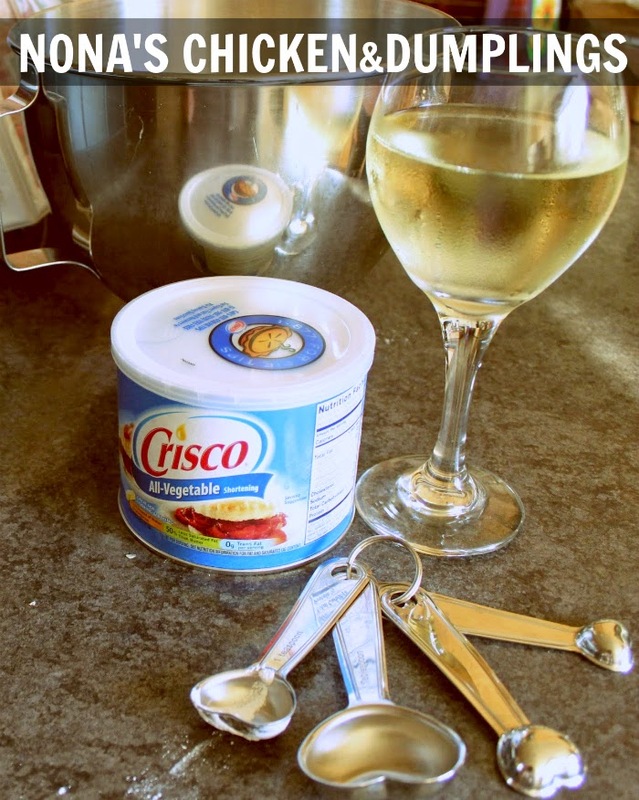 Wine and Crisco. That's a match made in heaven. 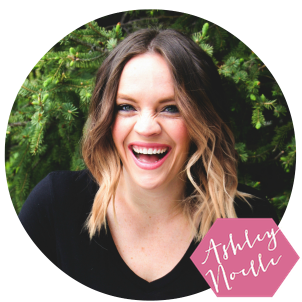 And speaking of heaven, there is something I have just been dying to eat seconds and thirds of to share on this blog. 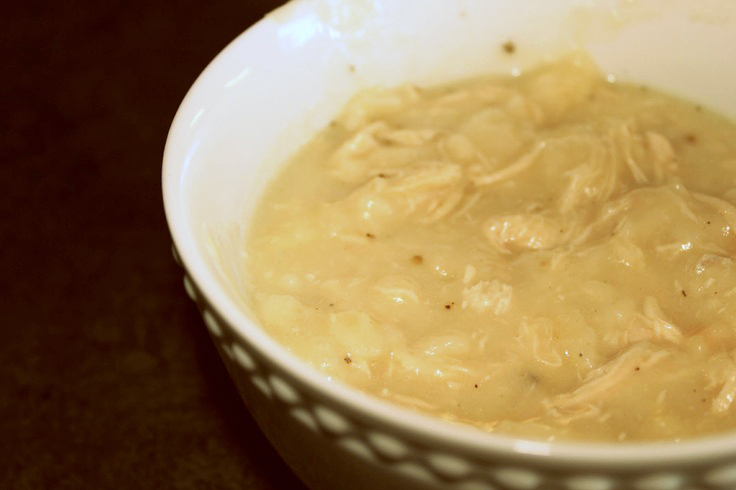 That is her Southern Style, super simple, no nonsense, chicken and dumplings. It is so simple, I don't know why I haven't just been making it myself. Oh, yes I do, because there is just nothing like your mama's cooking. Even when it's your husband's mama. But in all honesty, it really is simple. And you cook the entire thing in one pot, which is awesome for easy cleanup for us moms. You start by just boiling some chicken with butter for about 20 minutes. Making the dough is just as simple as cooking the chicken. All it is is flour, baking soda, and salt and Crisco. Once it's crumbled together, she stresses the importance of not using milk. I know that is traditional, but hear me out. If you add milk instead of the chicken stock, the dumplings taste a little bland. Using the chicken stock really adds another dimension of flavor. Some like to drop the dumplings in circles, but not Nona. She cuts them into about 2 inch slices and drop them into the boiling pot. This ensures the dumplings cook through. Nona's chicken and dumplings are so thick and creamy- you would swear there was milk or cream in it. This dish is perfect for a crisp fall night, snuggled up with your loved ones. Of all the things Reese's Nona makes, this is the thing both Hubby and I requested. Go make yourself a pot today! 2 bone in Chicken breasts. Cover 2 bone-in chicken breasts in a large pot with about 6-8 cups of water. Make sure they are completely immersed in water with 2 inches above the breasts. Add 1/4 stick of butter and bring to a boil, cooking chicken fully- approximately 20 mins. Make sure the chicken stays covered with water the entire time. Remove chicken from pot to cool making sure to leave water in pot. Add 2 cups of chicken broth to soup pot. Meanwhile, make the dough. Mix 2 cups all purpose flour, 2 teaspoons baking powder, 1/2 teaspoon salt in a large bowl. Cut in 1/4 cup of Crisco. Work into crumbs with your hands until just combined. Add 3/4 cup of pot mixture to the mix. Turn pot back on to boil. Spread flour on a surface and roll dough out to 1/2 inch thickness. Cut dough into 2 inch long strips and drop into already boiling water. Once all dumplings are in the pot, turn water down to simmer. cover and cook for 15-20 mins- stirring occasionally. While dumplings are cooking shred the chicken making sure to remove all the bones. Test to make sure the dumplings are cooked and add the chicken to the pot. Add salt and pepper to taste. Mmmmm!! Love me some chicken and dumplings! This looks fantastic! Haven't had chicken and dumplings in years, but after seeing these pics and reading your blog, I might have to fix some! Yummy! This is what is for dinner tonight!